Most of our patients come to us with neuromuskuloskelatal problems, which means nerves, muscles, bones and joint problems. Often times there has been some sort of accident or injury, which cause things to just not move the way they should. The majority of our practice is getting those patients moving again properly and increasing their range of motion. We relieve the nerve irritation while restoring normal nerve function through focused chiropractic adjustments and other modalities that promote balance and quicker healing—like massage, stretching, exercise, acupuncture and more. But Isn’t That What Chiropractors Do? Well, yes…and no. Most chiropractors work to achieve mobility by adjusting the spine only. 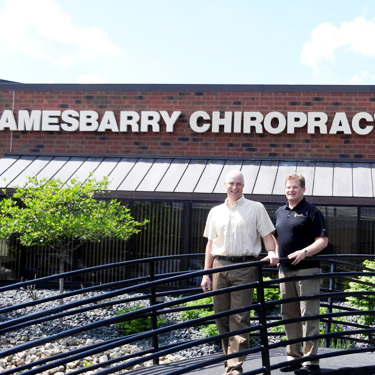 At Amesbarry Chiropractic, we do things a little differently. We adjust the spine, but we also look at your extremities and make adjustments to those areas as necessary. These areas include your shoulder, elbow, wrist, hand, fingers, hip, knee, ankle, foot, and toes. Our goal is to keep your entire body balanced and functioning optimally, and we’re proud to be able to provide this type of focused care exactly where your body needs it most. The way you walk or use your arms can have a profound effect on your overall posture and body alignment. Adjusting the extremities to correct for any structural abnormalities helps restore proper function to those areas. Extremity adjustments can also help you maintain your spinal adjustments by making sure that your posture is correct. In addition, we also offer cost effective, custom made orthotics that can be fit at our clinic through Foot Levelers. Most patients are amazed at the impact a custom insert can have on your mobility and posture! Our practice is truly about family care. We see everyone from infants to the elderly, including many athletes. In some cases, we’ve even treated multiple generations of the same family. Our techniques are gentle, yet highly effective. And we help you understand what you can do at home to heal more quickly with results that last. Our acupuncture and nutrition services compliment your chiropractic care for overall health and wellness.